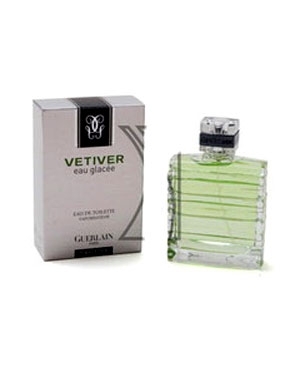 Seeing a name like "Eau Glacée" (which means "ice" in French, or, in this context, "frozen fragrance"), I automatically thought this would be some silly "Sport" version of Guerlain's original Vetiver. As it turns out, mercifully, not so. This is an excellent vetiver fragrance, and does nothing to tarnish the Guerlain Vetiver pedigree. Eau Glacée is a crisp, tart and dry vetiver scent, with a beautiful green, bitter vetiver note unhampered by heavy or sweet notes. This is a true vetiver fragrance. At the same time, however, Eau Glacée does very little to distinguish itself from the original Vetiver. I smell little to no sense of this being a cold or iced down version of Vetiver, which I suppose Guerlain could have acheived by adding something like spearmint or cucumber to this fragrance. In fact, this merely smells like a less complex version of the original Vetiver; it lacks the tobacco, wood and pepper notes that make the original sparkle. Eau Glacée basically smells like a really good quality vetiver oil augmented by crisp, bright citrus notes, and that's about it. There's certainly nothing wrong with that, but I was expecting more from a Guerlain Vetiver flanker than this. The bottom line is that Vetiver Eau Glacée is an excellent vetiver perfume, certainly better than many other vetivers I've tried; Etro's Vetiver, L'Occitane's Vetiver, Creed's Vetiver, e.g. - all inferior to this. However, you'd be wasting your time seeking this out (it's not easy to find now), considering the original is still in production and is a better fragrance. Sure, if you can find a bottle for a really good price, definitely snap it up, but don't kill yourself trying to track this down. There simply isn't enough to separate it from the original Vetiver to justify the effort.